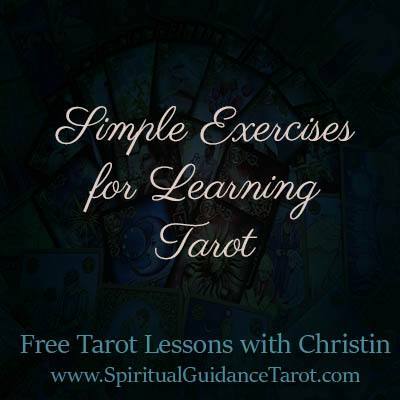 What follows are some simple exercises for learning Tarot in an intuitive, personal and meaningful way. Tarot is not about memorizing a bunch of other people’s definitions. If you approach learning Tarot in this manner you will end up frustrated and will probably give up altogether. There are many books by many authors with many interpretations, but rather than memorizing their interpretations what you want to do is learn from them while at the same time developing your own tarot language. Each of us will connect with the cards a little differently. Although there is some “universal’ symbolism to each card, the deeper meanings and subtleties are very individual. In order to be an effective reader, you have to connect with your cards. You need to know what they say to you, how they make you feel, how they tie into one another from your frame of reference. The best way to do this is through a Tarot journal. I suggest using a 3 ring binder for this so you can add, subtract, move around etc as needed. Choose the deck you want to learn with. For beginners, I recommend a Waite deck or one based on that since they have the most learning material available. You will need a place to do your journaling that is very quiet so that you can concentrate, undisturbed for at least fifteen minutes or so. Work on one or two cards per day until you complete the entire deck. You don’t want to do more than that because you don’t want the exercises to blend into each other or to try to do too much at once. Doing no more than a couple per day allows time for the information to ‘sink in” and for your meanings to develop. The idea is to take your card of the day and place it in front of you. Look at it for 30 seconds and record in your journal your first reactions to the card. Answer the following questions. What is the first thing you noticed? How does the card make you feel initially? What is the mood of the character(s) depicted in the card? After this initial observation, spend several solid moments looking into your card. Noticed different shapes, symbols, and colors; make note of what they are and what you think of when you see them. This doesn’t have to be perfect this is just the observation phase and notes help you make more careful/detailed observations. The last step is to write a story about the card. What is going on, who are the character(s), where are they, what are they feeling etc. What lessons does this story teach? This helps to personalize the card for you. As you learn to read the cards you will see how the stories begin to blend into each other, and how these card stories coincide with real life events in a querrent’s life. Start at the beginning of your deck with the Major Arcana. Do the above exercises for at least fifteen minutes per card. Once you have worked through the entire deck start back at the beginning by re-reviewing the cards. Add any extra insights or notes you want to your journal entry for that card. After you have done the Tarot journal you should find that spreads and readings begin to come naturally. For an ordered list of Tarot lessons go here. If this is your first time here you really need to start at the beginning to learn about the tarot journals, how I set them up and how you can use my technique to learn to intuitively and emotionally connect more deeply to your cards. The first obvious thing in this picture is of course the man is hanging upside down by his foot. He has a halo looking light around his head. The greenery grows in the background. He doesn’t appear to be upset or struggling – more complacent like he has accepted his fate and so he just hangs there. This card speaks to me of “comfort zones” – things that are not necessarily good for you, do not lead to growth, but yet for whatever reason you become resigned and continue to just hang in there. The greenery in the background suggests to me that there are “greener pastures” waiting if one can just correct their path and right themselves. In the stillness our answers come which allow us to see clearly how to correct our path. TThe Major Arcana consists of the 22 cards listed below. 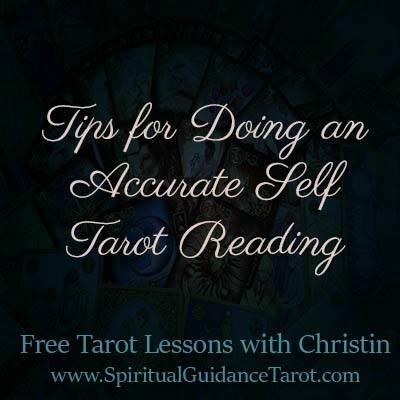 Each one is covered in detail in the free Tarot lessons. 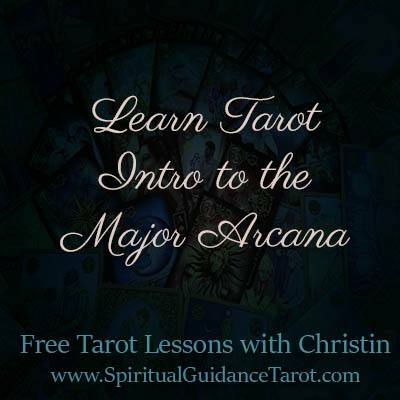 Find the full list by clicking on the “learn tarot” tab on the main menu. When an abundance of Major Arcana cards appear in a spread it indicates that the situation being read about is of great importance to the questioner. Each Major Arcana Tarot card represents a different phase of the life path or soul’s journey. They symbolize different lessons, experiences, and growing/learning periods. Sometimes when doing readings, particularly when reading yourself, it’s good to choose one of these cards as a significator. It gives insight into the querrent and where they feel they are regarding the situation at hand. Someone who is just getting ready to go to college for example and is new to their field of study may choose the fool as their significator. The fool represents youth, newness, an open mind and a start to your journey. Someone who is at a later stage of their life who is a grandparent and seeking wisdom about their golden years may choose the Hermit as a significator. This is the card that symbolizes the elder who has gained much knowledge/wisdom on his path and is in the process of sharing that experience and being an example to others. These are just brief examples and I will go more into the significators when I delve into each card individually. Below is a list with brief descriptions of each of the Major Arcana cards. Simple Interpretation: The fool represents fresh starts, new beginnings, the start of a venture. Approaching something with an open mind/heart. Can indicate a period of being naive or a bit irresponsible. Simple Interpretation: The Magician represents someone who is ingenuitive, charming and persuasive. They are able to gain the support of others and are creative and skilled problem solvers. Magician speaks of a need to use one’s time and resources wisely. Simple Interpretation: This card represents wisdom, finding one’s center and maintaining objectivity, connection with one’s source, intuition/psychic senses, inner knowing and trusting one’s instincts/higher power to lead. Simple Interpretation: This card speaks of the spirit/earth connection, mother nature, getting back to basics. She is also the card of pregnancy/motherhood and maternal protective instinct. She speaks of simple abundance and appreciation for one’s blessings. Simple Interpretation: The Patriarch, family figure. He is a disciplinarian, authoritative. He takes charge and provides for the family as he pushes them to be independent. He speaks of ambition, strength and pushing oneself to achieve. Simple Interpretation: Tradition, leadership, sometimes dogma or rigid rituals. This card is the traditional card of a priest-like figure who is the head of his congregation. It speaks of responsibility and the need for both tradition but also flexibility and finding one’s own path to truth. Simple Interpretation: Romance/love in the more literal sense but symbolically it speaks of unity, bringing together opposites (such as a good blend of creativity and logic) It also speaks of resolving conflicts and enjoying the use of the physical senses – simple pleasures. Simple Interpretation: The card of drive and determination, the ability to overcome obstacles through taking decisive action. This is a card of becoming goal oriented and ambitious. Motivation and also resourcefulness. Simple Interpretation: This card speaks of learning to be in control of the mind/behaviors of the self as opposed to a slave to circumstance. The woman recognizes she can’t control the lion at her feet and it brings her a certain peace as she learns to direct her energy towards self-control/restraint. Simple Interpretation: Wisdom gleaned through experience, listening to your inner wisdom – finding yourself. This is a card of coming of age or attaining a peak level of experience and reflecting on the knowledge gained. Is also a card of solitude and learning to be alone but not lonely – finding one’s true passion. Simple Interpretation: The cycle of destiny is represented by this card. It reminds us that the only constant in life is change. Depending on how it appears it can indicate a positive cycle of rewards or a period of challenge. Simple Interpretation: Fairness, doing what is best for all concerned, objectivity and seeing the whole of a situation from a balanced perspective. Taking all sides of a story into consideration and weighing your decision carefully. Simple Interpretation: stasis, not moving, status quo. It tends to indicate situations that have come to a standstill but can also indicate the need to stand still and think about things awhile before moving forward. Sometimes ‘down time’ gives us the necessary time to consider all our options. Simple Interpretation: Transcendence, metamorphosis, growth. Typically this represents a cycle of growth that comes through a period of sacrifice or initial loss. It is not a card of fatality – but a card of cyclical rebirth and being reborn into a new way of living. Simple Interpretation: Imprisonment, defeat, self-harm. This card speaks of all the things that hold us back, addiction, fear, the inner critic, abuses, anything that keeps us from reaching our fullest potential. It can also indicate others in the querrents circle who are abusive or deceitful. Simple Interpretation: upheaval, surprise, crumbling foundations, changes that come from out of left field, unpredictability. This card can indicate challenges but also happy surprises depending on the cards that surround it, but regardless it means a major and sudden change to one’s course. Simple Interpretation: Hope, Joy, Inner peace. Feeling a connection to one’s source that provides a strong faith in oneself and one’s higher power. This card speaks of spiritual sustenance and overwhelming potential. It’s considered one of the most positive cards in the Tarot. Simple Interpretation: Intuition, dreams, the subconscious are all represented by the moon. It also speaks of deep emotions and usually some degree of depression or sadness – “the blues”. When this card is properly balanced it can depict one with strong psychic senses/empathy particularly when paired with the priestess or queen of cups. Simple Interpretation: Pure raw energy the sun represents the power/energy that encompasses everything. It speaks of directing our energy in positive ways and reminds us that our thoughts are energy and wherever they go our energy flows. This card speaks of abundant creative energy and the need to direct it properly into healthy areas. Simple Interpretation: Enlightenment, evaluation of life’s lessons. Looking for the truth behind one’s experiences. Seeking wisdom and knowledge. Discernment and seeking divine inspiration or signs on one’s path. Also this is a card of being honest without being harsh – discipline rather than punishment… a little honesty cures many things but criticism tends to make us defensive or want to quit. Simple Interpretation: Seasons and cycles, the whole. This card reminds us that all parts make the complete circle. There must be both day and night, summer and winter, all these opposites are both equally vital and compose the whole. This card speaks of the whole realm of experience, things that come full circle.